Noosa with perfectly paired toppings. 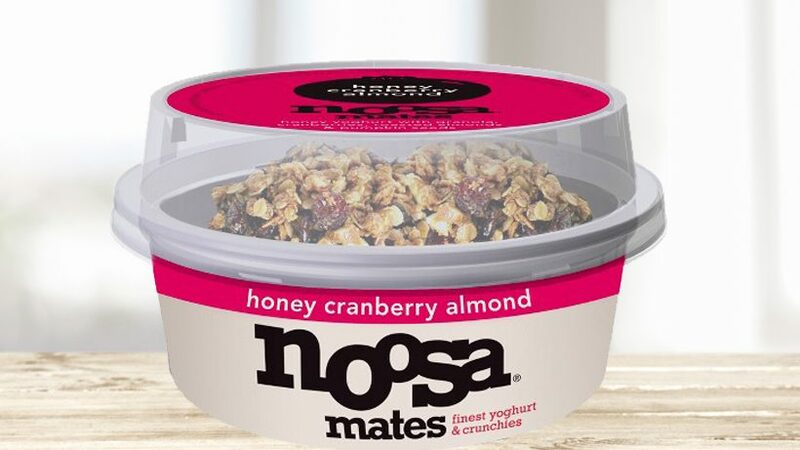 Try Banana Chocolate Peanut, Coconut Almond Chocolate, Honey Cranberry Almond, Honey Pretzel Peanut, Maple Ginger, Caramel Chocolate Pecan, Coffee Chocolate Almond and Cookies & Cream Noosa. 5.5 oz tubs with toppings. Ingredients:Coffee Yoghurt [Grade A Pasteurized Whole Milk, Coffee (Water, Sugar, Sweetened Condensed Milk, Coffee Extract, Natural Flavors, Locust Bean Gum, Lactic Acid, Pectin), Cane Sugar, Kosher Gelatin, Pectin, Live Active Cultures (S. Thermophilus, L. Bulgaricus, L. Acidophilus, Bifidus and L. Casei)], Dark Chocolate (Sugar, Unsweetened Chocolate, Cocoa Butter, Dextrose, Sunflower Lecithin), Coffee Crunch (Sugar, Coffee Crystals, Tapioca Syrup, Salt), Almonds. Ingredients:Cream Yoghurt [Grade A Pasteurized Whole Milk, Cane Sugar, Water, Natural Flavor, Tapioca Starch, Kosher Gelatin, Pectin, Lactic Acid, Live Active Cultures (S. Thermophilus, L. Bulgaricus, L. Acidophilus, Bifidus, L. Casei)], Cookies [Enriched Flour (Wheat flour, niacin, reduced iron, thiamine mononitrate, riboflavin, folic acid), Sugar, Palm Oil, Cocoa (Processed with alkali), Corn Flour, Leavening (Sodium bicarbonate, monocalcium phosphate), Salt, Sunflower Lecithin, Natural Flavors, Chocolate Liquor], Salted Dark Chocolate Sprinkle [Sugar, Cocoa (Processed With Alkali), Natural Flavor, Salt], Brownie Bits [Wheat flour, Sugar, Coconut Oil, Cocoa (Processed with alkali), Sunflower Lecithin, Baking Soda, Salt, Natural Flavors], White Chocolate Chips (Sugar, Cocoa Butter, Milk, Sunflower Lecithin, Vanilla).